Our columnist looks back at the best and worst of the year in show jumping. It was no secret that the U.S. team was a strong favorite to be in the running for a medal at the 2010 Alltech FEI World Equestrian Games (Ky.). As the defending Olympic team gold medalists, U.S. riders have moved from strength to strength on the international stage. The team’s disappointing results at the WEG were not a reflection of the usual form of U.S. riders against strong international competition. Past Olympians won far more than their share of major classes on the world stage, with McLain Ward and his incredible mare Sapphire leading the pack with major wins at home and abroad. Laura Kraut and the diminutive Cedric were the only pair to win two Global Champions Tour events in 2010, while Lauren Hough with Quick Study led the victory gallop at another. The end of the Meydan Nations Cup League found our team in second place in a very difficult year competition-wise, with extra countries not only participating but fighting for a treasured spot in next year’s tour. Not only did we field teams at each of the Meydan series events, but we also sent a successful group of riders to the increasingly important European tour of Young Rider team events this past year. Karl Cook, Nick Dello Joio, Michael Murphy, Taylor Land and Jennifer Waxman represented us well throughout with several class wins and a top-placed finish in the team event in Weirden (the Netherlands) in a jump-off against the home team. It is great that these riders can get their feet wet against the upcoming crop of European riders. It will give us an edge when it comes time for this younger generation of riders to take their place on senior teams. Ward and Sapphire won just about everywhere they showed, amassing an amazing string of victories in major events. Among their wins were the $500,000 FTI Consulting Grand Prix in Wellington, Fla., the Grand Prix of La Baule (France) and Rome (Italy), the $250,000 FTI Grand Prix CSI-W at the Hampton Classic (N.Y.), along with the Pfizer $1 Million Grand Prix at HITS-on-the-Hudson (N.Y.), before finishing the year with a win in the $100,000 President’s Cup CSI-W at the Washington International (D.C.). It amounted to an unprecedented record of victories in some of the biggest money classes offered in our sport. Here at home, the Adequan FEI North American Junior and Young Riders Championships returned to a Kentucky Horse Park that was preparing for the upcoming Alltech FEI World Equestrian Games. This provided an opportunity for younger riders from throughout the country to experience some of the excitement that goes with an international championship event. This sort of experience can turn the sport at the highest level into a real life ambition for certain riders. 2010 also marked the first year for a whole new undertaking for the International Olympic Committee. In addition to the traditional Olympic Games, a new Junior Olympics was launched with jumping as the sole equestrian discipline. Eirin Bruheim of Texas represented the United States as part of a North American team at the inaugural event, held in Singapore. All riders were on strange horses, part of a group specially selected and prepared for the event. On the national front, while some competitions continued to see some reduction in the number of competitors, the sport as a whole continued to grow. The first ever $1 million class was staged by HITS in Saugerties, N.Y., and brought entrants from throughout the United States and Canada. Excitement was high, and the event was successful enough to assure a repeat offering in 2011. Meanwhile, early in the year, the Florida circuits drew competitors from throughout the Americas, as well as a sizeable European contingent who prefered to compete outdoors and enjoy the vast array of offerings. The world of show jumping gets smaller all the time, with horses now flying in both directions on a regular basis. The various national championships for juniors, amateurs and young horses remain important goals for many as we see a steady improvement in the standard at everything from the Pony Finals to the three Young Jumper Championship regional championships. One program that I believe has a huge potential benefit for our sport as a whole is the U.S. Hunter Jumper Association’s Emerging Athletes Program. Melanie Taylor initiated it in 2009 and as the word spreads and people know what to expect, it will expand further. The EAP can play an important role in both locating potential talent (especially those that are not in the show ring week after week) and in giving those with lots of ambition and less opportunity the chance to both learn and perhaps have their talent be discovered. Two riders from the 2010 National Level 3 of the EAP took part in the George Morris Horsemastership Training Session in January and acquitted themselves admirably. The emphasis the EAP puts on overall horsemanship might be the most valuable benefit for the sport and the industry over the long-term. While there was much to celebrate in the world of show jumping in 2010, it might well be most remembered by some notable losses. Perhaps the most innovative and forward-thinking individual our sport has known over the last several decades lost his courageous battle with cancer the end of this last year. Gene Mische, with a background in every facet of the industry, used his role in competition management to lead jumping forward in ways that few of us fully appreciated at the time. His dream and determination produced the first grand prix in the United States, and he went on to create the Florida winter circuit and the American Grandprix Association—a national league of grand prix events that helped bring us the sport we have today. Our industry would never be what it is now without his vision and endless energy in introducing and establishing ever-improved competition in our country. The loss of two other individuals will also be felt with heavy hearts for years to come: rider Tim Grubb and owner Peter Wetherill. We don’t have a sport without the exceptional efforts of a whole group of individuals. Great organizers, riders and owners are all essential, and we lost some of the best with Gene, Tim and Peter. The year 2010 will remain in memory for two additional reasons. Everyone who follows jumping even casually remembers learning with amazement of how the Fédération Equestre Internationale treated Sapphire following the second round of the 2010 Rolex FEI World Cup Final in Geneva, Switzerland. Ward and Sapphire seemed on track for a potential win when the officials at the event disqualified her for vague and (as it turned out) unsubstantiated allegations of a “hyper-sensitized” front leg. Relatively new procedures implemented by the international body were poorly handled, while the rules in place left nowhere to turn for McLain. Vindication came, but far too late for the pair to try to accomplish what no American has done for far too long—to win this largest indoor event. It was a huge disappointment for McLain and his whole team, but I believe we all have to admire him for getting the only revenge possible under the circumstances: winning just about everything out there the rest of the year. We can only hope that FEI officials learned some important lessons—at McLain’s expense—and will avoid taking actions that deprive an athlete of the opportunity to compete on the basis of poorly conceived rules and inadequate procedures. The WEG, held for the very first time outside of Europe, will always be associated with the year 2010. Having this pinnacle of equestrian sport in a venue where Americans didn’t need a passport to attend was such an incredible opportunity for people who otherwise wouldn’t get to see it. I continue to meet people who went and saw outdoor jumping at this highest level for the first time. Every single one of them was inspired by what they saw and amazed at the level of riding and the abilities of the horses they saw. Seeing the top can only be good for every level of the sport. A clear beacon at the top of the pyramid can be the motivation for all those moving step-by-step in that direction. While the results of the jumping team, finishing in 10th and failing to qualify for the 2012 London Olympic Games, were a disappointment for our exceptionally strong U.S. team, seeing the ever-improving level of riding from every corner of the world was certainly impressive. Events such as this one remind us just how difficult this sport is—both a human and an equine athlete must be at their absolute best on a specific day. And this particular event requires near perfection over multiple rounds: three days and three rounds just for the team competition, and five days and nine rounds total to emerge with the individual title. Our riders excelled on the first day, but a series of small disappointments for each rider proved very costly over the next two days. This is the sport, however. Anyone who cannot deal with it would be better to choose a different one. Our top riders know that disappointment must serve to make you stronger and motivated to work even harder. We should all try to keep this winners’ attitude in mind as we go into the new year. 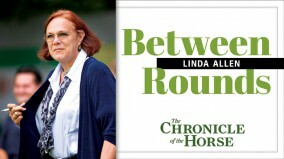 Noted international course designer Linda Allen created the show jumping courses for the 1996 Atlanta Olympics and the 1992 FEI World Cup Finals. She’s a licensed judge, technical delegate and a former international show jumper. She lives in Fillmore, Calif., and San Juan Cosalá, Jalisco, Mexico, and founded the International Jumper Futurity and the Young Jumper Championships. Allen began writing Between Rounds columns in 2001.